It's Thanksgiving! I love Thanksgiving because it's a holiday about Gratitude, and well, what's not to love about Gratitude! When live gets heavy on our shoulders, it's gratitude that keeps us going forward. I'm especially grateful for friends and colleagues I've met along my path as a holistic nurse entrepreneur and photographer. Some friends I've only met online, but we have so much in common, and belong to the same online groups, such as the American Holistic Nurses Association Entrepreneur Chapter that I'm sure I'll meet them in person one day soon such as at our annual conference. I recently reached out to ask who might want to guest blog for me. It's no easy feat to talk about photography, dementia and caregiving (the topics of my upcoming book) in a personal way. Elaine Nieberding raised her hand and wrote a beautiful post that I know you will enjoy! I am grateful for you Elaine! It's a bittersweet November week for me (a nurse too, like your beautiful blog hostess Carmen). Why? Well, 2016 is the first year my parents won't be at the huge annual Turkey Day gathering at my home. Last year Mom, at 96, was too weak to climb steps to our main level dining room, so we moved the feast table to the accessible ground floor family room. Dad too had his walker, at 97, and ambled around a little easier than Mom, but -- they made it. They wanted to hang out with the clan, to see their youngest great grandchild, shy of a year old, to savor corn pudding and other family favorites, and surprise us, once again with their "risen for the event" coherence, attention, and contribution of their essences of Self. But dog-gone it -- I was so busy with all the different arrangements in the house, and tending to the comfort and relief needs of my precious elders, that I forgot to take my usual snapshots. Recognizing my loss, I was triggered to capture pretty, playful and poignant moments, and possessions, places and spaces of my parents in months ahead in their residence community. A usual couple-shot portrait by the big holiday tree, a hallway bench candid, my Dad having a video hangout call with my brother, and my mom, in quiet repose in her bed -- these were some of the images that became my memories. And I'm soooooooo very glad I did. Mom and Dad did end their journeys in this 'Earth School' this year -- surprising that it was Dad to pass (February) before Mom (May). This grieving thing is rather new to me. And so this week, as I slide forward to the family reconnection events, I'll share my thankful thoughts. 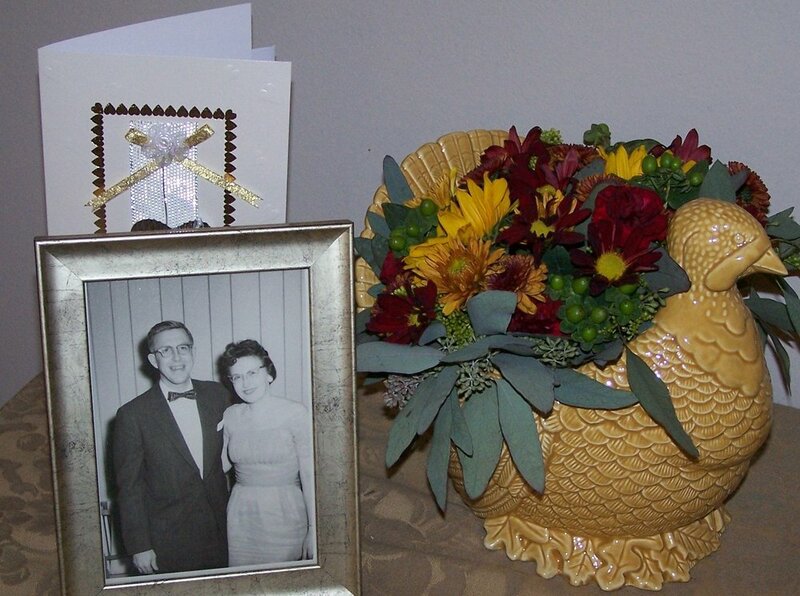 I'm grateful for my choices of the last two years -- to leave bedside nursing in 2014, and become part of my parents' caregiving team in their retirement community . I'm grateful I took the time to dig through their memorabilia and reread to them the letters they had written to each other in courtship - and be present to their listening and holding hands at the kitchen table. I'm grateful that I have photos capturing both pleasures and poignancies of their life journey -- I'll let my intuition guide me what to pull out for family sharing later this week. I'm especially grateful that I was wise enough to nourish myself with support during my heavy-duty caregiving of the last year. One way was scheduling time each week to expand my helping skills learning life and wellness coaching, plus receive the healing coaching benefits from my fellow students too. How valuable to both experience and extend -- the capacity to be truly heard in a safe space, feel hopefulness and the creative capacity to find solutions in trying times, and beautiful revelations that came with powerful questions. Can I let myself feel, right now -- self-appreciation for the love I've extended to elders and others as a perfectly imperfect caregiver, friend, family member or companion? For those whose legacies I want to treasure in future days, is there something I can do, just a wee bit differently, to bless this intention in days ahead? Will I allow myself well-deserved nourishment to more frequently experience abundance, balance, and the flow of love, and grow as a listening, caring, healing presence? I'm grateful you've found your way here in cyberspace so we could get acquainted. Carry on -- and I wish you a blessed Thanksgiving and coming Holiday Season. Residing in Maryland, board-certified holistic nurse and life coach Elaine Nieberding has a passion for helping people fully tap their capacity to be healing, helping presences in the world. She is a former bedside oncology RN, online wellness educator and video show host, teacher of laughter yoga and now certified to practice Wisdom of the Whole life coaching (WWCC).